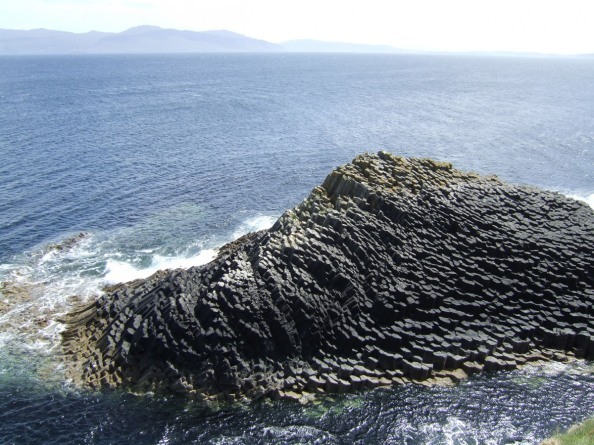 If you’re planning on holidaying to the West coast this Summer, then you might want to consider a day trip to Staffa and Lunga. Turus Mara are now running day trips throughout the Summer until October with an all-in-ticket that includes ferry passage from Oban to Craignure, on the Isle of Mull where you are then taken by minibus directly to Ulva Ferry. For those worried about sea-sickness, it’s only the last 10 minutes of a 50 minute journey as the boat enters more exposed waters that might be cause for concern and that’s only if you are below deck. But don’t worry, there is a toilet on board! Better still if you can, try and bag one of the sixteen seats on top deck even if it means elbowing some school children out of the way. The awesome hexagonal ballast columns on Staffa greet you as you come into port (although the Captain of the Hoy Lass ferry assures us that there are in fact at most only seven sides to the columns). You are given an hour on Staffa which is just enough time to climb the steps to the top and eat your packed lunch with views of Iona Abbey and the Treshnish Isles, free of the worry of tick bites as Staffa has no deer or bracken for them to hide. This lack of bracken is sure to be a hit with Scottish wild flower enthusiasts or in fact any Highland inhabitant as they will tell you that the amount of bracken has grown significantly in recent years with the steady decline of grazing and crop planting. So don’t mention the ‘B’ word to any locals you might meet. After lunch, there is still have enough time to walk back down and precariously edge your way to hear your echo in Fingal’s Cave before taking the boat onwards to Lunga. 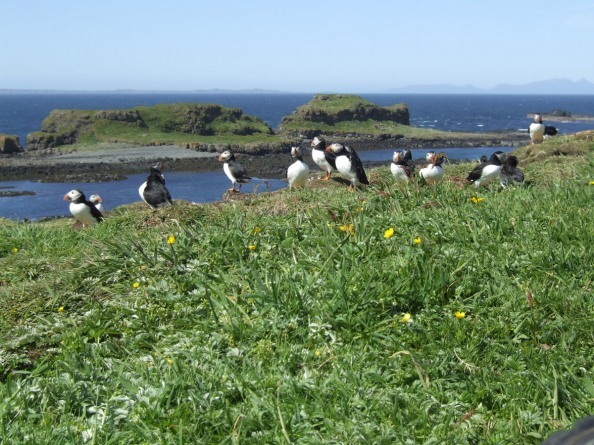 Lunga will tick your bird-watching boxes with a large population of puffins, guillemots and shags. However, for birds that have colonised an uninhabited island, the puffins seem rather sociable as you’re able to get within a few feet of their cliff-top nests. We were also lucky enough on the day to spot the fin of a basking shark in the bay and a couple of seals on the rocks on the way back to Ulva Ferry. Day-trippers to Mull are bussed back to Craignure just in time to catch the 7pm ferry back to Oban.